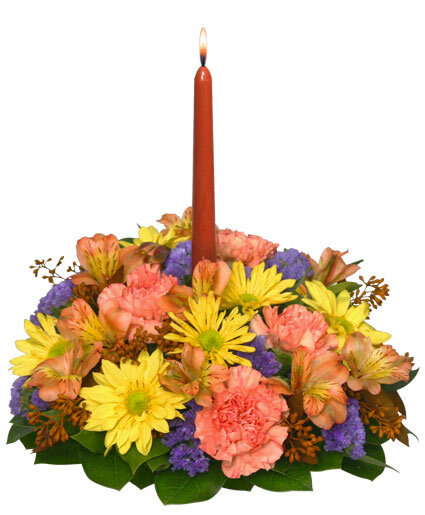 Utility Container With Wet Floral Foam, Taper Candle, Foliage: Salal Tips, Green Pittosporum, Brown Seeded Eucalyptus, Orange Carnations, Yellow Daisy Mums, Peach Alstroemeria, Purple Statice. 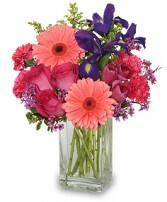 Winter is almost over and we are passionate about the arrival of Spring! 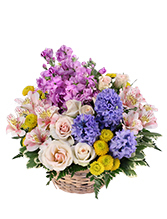 .Nothing says that spring is here, with summer not far behind, better than this lovely combination of our Spring favourite flowers.Fragrant blue hyacinth,lavender stock,to make a perfect bouquet to make you feel young at heart.